market. A key customer and exhibitor has been encouraging us to attend this show for years, and we’re grateful that we took their advice this year. The Outdoor Retailers show has two versions each year – winter and summer – and they have all been held in Salt Lake City for the last two decades. We spoke with show management to more learn about the relative size of this year’s event. Roughly 1,100 companies displayed, occupying more than 400,000 square feet of exhibit space. 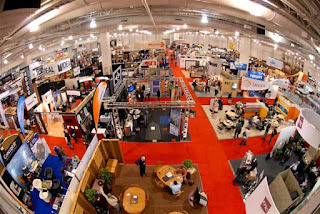 Exhibitors filled every nook and cranny of the Salt Palace Convention Center, using the dedicated trade show space, but also meeting rooms, ballrooms, hallways and lobbies. Representatives for the Outdoor Industry Association, the show’s organizer, told us that the summer show is even bigger, as nearly 500 additional exhibitors take residency in several large semi-permanent tent structures on the convention center grounds. Although final attendance figures have not yet been released, the association expected roughly 22,000 attendees. Thursday, was kicked off by the All-Mountain Demo on Monday at a local ski resort. Visitors were able to use not only skis and accessories, but snowboards, snowshoes, winter camping gear, jackets, gloves, boots and more. Tuesday’s festivities included a fashion show featuring trends and the latest looks from the outdoor industry. Other events throughout the week included seminars, parties and receptions. The show also hosted the Outdoor Inspiration Awards, celebrating those that inspire and encourage others in their communities to enjoy, participate in and support outdoor activities and the outdoor industry. The event was not without controversy. Peter Metcalf, founder of Black Diamond, a manufacturer of equipment for climbing, skiing and mountain sports, wrote an op-ed piece in the Salt Lake City Tribune entitled, “Time for Outdoor Retailers toLeave Utah and its Anti-Recreation Politics.” Essentially, Metcalf accused Utah Governor Gary Herbert and Utah’s congressional delegation of running an anti-public lands agenda, including withholding of funding for public lands, transferring ownership of U.S. lands to state ownership, and working to reverse President Obama’s designation of the Bear’s Ears National Monument in Southeast Utah on December 28. Slacklining demonstrations took place on the show floor. municipal and state economies. Metcalf called for the association to leave Utah “in disgust” when its contract expires in 2018. Metcalf was not alone in his criticism, as Patagonia and other companies called for the same action. Gov. Herbert fired back, indicating that opposition to the Bear’s Ears monument was rooted in the process by which the designation took place. He asserted that state and local authorities were not consulted before the announcement, even though they are prime stakeholders. This type of controversy has plagued the show before. In 2004, the association threatened to pull the shows out of Utah over a similar perceived threat to Utah’s public lands. In response, then Gov. Mike Leavitt worked with local governments to expand the Salt Palace in order to appease the association. Beyond the politics, this show was a marvel to behold. Regardless of the controversy, it is apparent that the outdoor products industry is thriving. Its impact includes millions of jobs and billions of dollars in the U.S. alone. Its global impact is profound, as evidenced by a large contingent of international exhibitors. We look forward to attending the summer show to learn more ways that Americhem can bring innovation to an already innovative industry.